This study deals with the design of a spring backboned soft arm, which will be employedfor generation of human gesture as an effective means of Human‐Robot interaction. The specialfeatures of the proposed mechanism are the light weight and the flexibility of the whole mechanismby using a spring backbone. Thus, even in the case of collision with human, this device is able toabsorb the impact structurally. The kinematics and the design for the soft arm are introduced. Theperformance of this mechanism was shown through experiment emulating several human gesturesexpressing human emotion and some service contents. Finally, this soft arm was implemented as thewing mechanism of a penguin robot. In the environment where human and robots coexist, robots should be designed and programmed in such a way that they are able to interact with human socially and physically in a safe fashion. The concept of HRI (human‐robot interaction) has been evolved according to this demand. Robots being developed with the background of HRI collect sensors’ data, process the signals, recognize the information, and finally provide valuable services to human. As an example, the robot recognize the face of human by camera, detect the motion of human by a position sensor, and receive the intention of human by voice recognition. Combining those sensors’ information, the robot decides the contents of the service, the sequence of service, and finally come to service action. Besides routine services such as many manipulation jobs and vocal service for human, facial expression or some gesture of robots help communication with human. Imitation of the facial expression[2,3] and gesture[4,5] of human are very important since it provides a familiar feeling when robots interact with human. One of most critical issues of HRI is safety. Since the robot interacts with human physically or indirectly, a small position error or some programming error might cause crash between human and robot and resultantly damage the human body. Therefore, robot must have a soft arm structure that can absorb the shock or impact when contacting the human body. 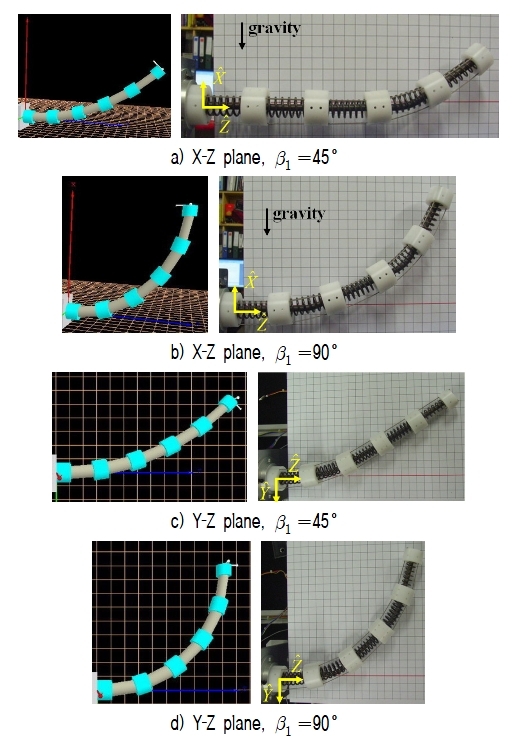 Design of a structurally soft robot hardware or precise control algorithm is required at the existence of such probable physical interaction. Investigation of soft arm has drawn much attention recently. Kawamura, et al. developed a soft arm using pneumatic actuator. Bicchi, et al. investigated the tactic of fast and soft arm. Choi, et al. proposed a continuum mechanism applied to the design of soft endoscope. Park, et al. [9,10] proposed compliant arms that have variable compliance at the robot joint or link. Khatib, et al. 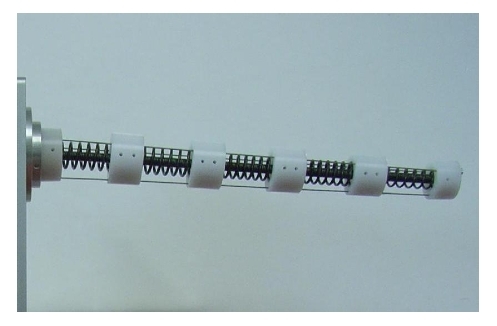 proposed a dual‐actuator based feedback control algorithm to realize the soft arm. Yuki, et al. 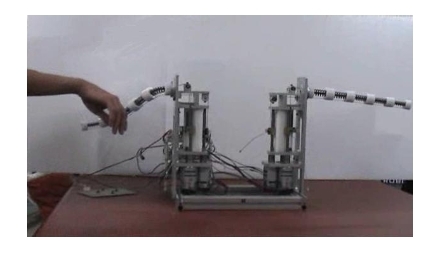 developed a soft manipulator with flexible joints using smart fluid and pneumatic cushion. Yoon, et al. designed a safe arm with MR‐base passive compliant joints and viscous‐elastic covering. The objective of this study is to suggest a new soft arm for imitating human gesture, which is not only a means to enhance the effectiveness of HRI, but also enhances the safety by employing a soft arm structure. The special feature of this soft arm is the spring‐backboned structure, which allows structurally flexible characteristic. Even in the case of collision with human, this device is able to absorb the impact. The driving unit and the mechanism are separated. Thus, wide range of workspace can be ensured and a fast motion can be created because of small inertia of the system. The section II deals with the kinematics of the soft arm. Its design will be described in the section III. Experimental implementation of diverse gestures is demonstrated in the section IV. Finally, we draw conclusion in the section V.
This study deals with the design of a soft arm with less number of actuator and emulate the motion imitating a couple of human gestures. Only three DC motors are used for this purpose. Fig. 1 shows the prototype of the soft arm. A spring is used as a backbone. The spring backbone is wrapped by acetyl cylinders at a regular interval, which are connected by wires through three holes pierced in the cylinders. As shown in the figure, the arm is slimmed down from the proximal joint to the distal joint in order to reduce the weight of the arm. Applying tensions to wires as shown in Fig. 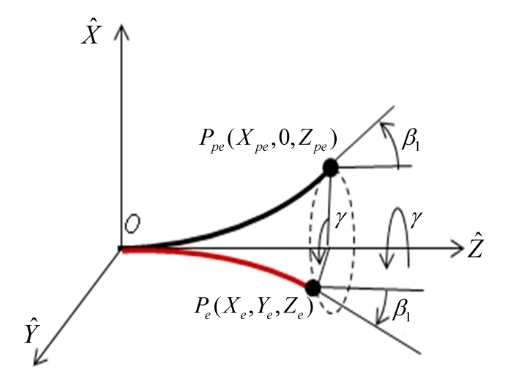 2(b), the general motion of the soft arm can be represented as superposition of compression along the axial direction and bending in the global X-Z plane. More specifically, Fig. 2(c) shows the deflection of one spring module caused by wire tensions. Note that because of the symmetry of the spring module, the length of the center line is the average of the lengths of the two sides. To find the end‐position of the soft arm relative to the global reference coordinates, first, a planar model is considered. Fig. 2 shows the configuration of the planar model being bent in the global X-Z plane where β1 denotes the absolute rotation angle of the soft arm about the axis. As in Fig. 2(a), one spring and one link are defined as one node. Particularly, the dotted lines in Fig. 2(c) represent the locations of the virtual wires which are assumed to be located both on the inner surface and outer surface of the soft arm in the global X-Z plane. It is noted that the end positions of the last node can be computed by summing up the lengths of wires that are assumed to be embedded along the center line of every node. To compute the lengths of two wires for the given output angle (β1), the positions (Xpe and Zpe) of the last node relative to the node reference frame XOZ are obtained first. Then, the lengths of two wires are calculated. Since the soft arm is designed symmetric as in Fig. 1, deflection will occur uniformly throughout every module. Thus, analysis of one module could lead the kinematics for the whole mechanism. For our convenience, the module is numbered from the distal node to proximal node. Fig. 3 shows a module i of the planar model where lengths of the center lines (i.e. P and ) are assumed known. where Δl is the amount of compression of the spring backbone as shown in Fig. 2(b). It is also noted that the proximal node is constrained to the wall such that βN+1 = 0°. To bend the structure, the relationship between β1 and the lengths of the pulling wires should be obtained. In the planar model, two wires are assumed to be embedded on the inner surface and on the outer surface of the backbone structure. In Fig. 2, Lc, Ls, and Ll, denote the length of the center line, the inner and outer boundaries of the planar soft arm model, respectively. where σ represents the torsion angle and is assumed to be 0 in our model. The position of the soft arm structure is represented by the given angles of β1 and γ. Particularly, because the rotation angle γ only transforms coordinates, it doesn’t affect the length change of the structure. 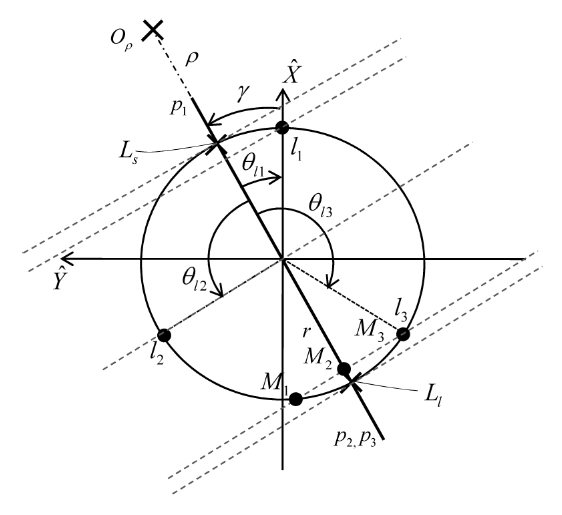 Thus, the length of the inner boundary (Ls) and the length of the outer boundary (Ll) in the spatial model are equal to ones in the planar model. Now, the relationship between the two boundary lengths and the lengths of three wires (l1, l2 and l3) is obtained from the bending geometry of Fig. 5 and the cross‐sectional area of the spring backbone structure given in Fig. 6.
which is the amount of the required length change of wires for the given output variables (β1, γ, Δl). Figure 7 shows the design concept of the proposed soft arm, which consists of an arm part and a driving part. The arm is designed by assembling a spring and hollow plastic cylinders. Three wires penetrate into the holes located at the cross sectional area of the cylinders. 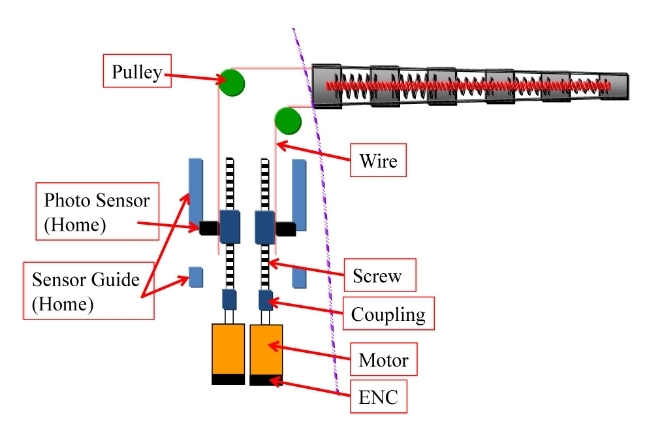 The driving unit adapts a linear actuator as the basic unit, which consists of a TM screw (M8; triangular gear with pitch 1.25mm) and a DC motor with encoder. The stroke of the screw is 35 mm. Three of this driving unit are assembled and placed 120 degrees apart. A pulley is employed to guide the pulling wire to the actuator and a photo sensor is used for home positioning. The arm comes to action when pulling the three wires simultaneously. The soft arm is designed to have a soft structure when contacting to environment or human. The spring mechanism plays such a role. Also, in order to prevent bucking of the whole mechanism, an extension spring or a flexible tube line is inserted at the center of the arm. Figure 8 shows the detail of the soft arm. It is designed by assembling several springs and plastic cylinders in a successive manner. As the length of the arm becomes longer, the whole mechanism deflects due to its own weight. Thus, we employ a light‐weight cylinder made of acetyl whose specific weight is about 1.4. Also we made several holes at the cross section of the cylinder to reduce the weight as shown in Fig. 9. Furthermore, the weight could be reduced by slimming down the arm from the proximal node to the distal node as shown in Fig. 8. Based on this design, Table 1. shows the final weight of each cylinder. The joint connecting two adjacent plastic modules is made by a coil spring so that the arm is able to bend when pulling the three wires. Table 2 shows the specification of springs. The diameter of each spring is decided properly according to the size of each node. The spring constants of all springs are the same. The driving wire plays the role of driving the whole mechanism as well as connecting the plastic cylinders and the springs. The diameter of the stainless wire is 0.8mm and its maximum tensile load is about 0.588~0.667 kN (≒60~68 kgf). The three wires are placed 120˚ apart so that the soft arm can be steered in all directions. In order to analyze the pulling load of wires, Fig. 10 depicts the moment created by the weight of the plastic cylinders. 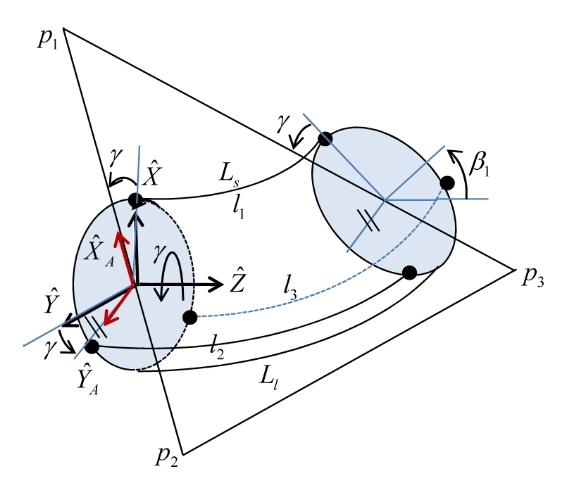 In addition to the deflection of the soft arm due to the weights of all nodes, there exists an internal deflection (i.e., a buckling phenomenon) of the soft arm due to the mechanical coupling among modules. In order to prevent such internal deflection, a spring backbone is inserted into the center position of the spring. Fig. 1 shows that the whole structure does not have such deformation due to the additional backbone spring. 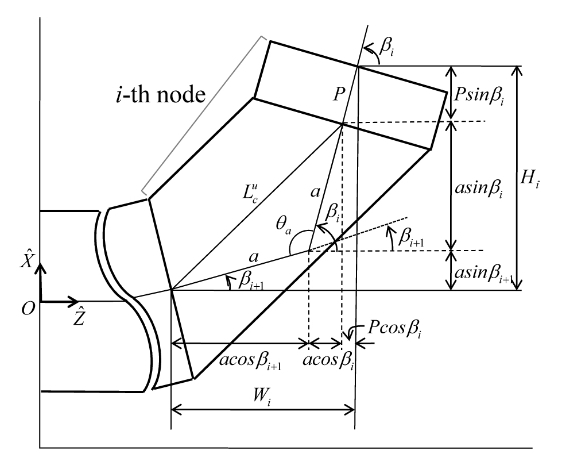 The torque required for the system operation can be derived from the screw mechanics depicted in Fig. 12. In Fig. 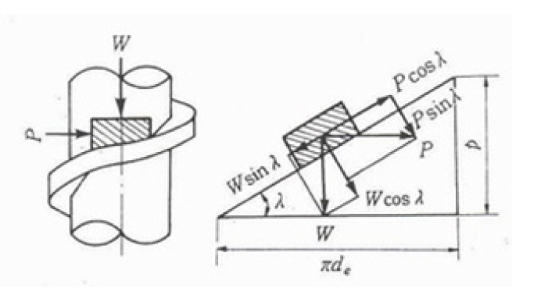 12, W, P, μ, λ, T, and de denote the axial direction weight (kgf), the radial force of screw (kgf), the friction factor of the surface of screw, the lead angle, the required torque (kgf․mm), and the efficient diameter of screw, respectively. The pulling load (W) of the wire to prevent the deflection of the soft arm was 0.67 kg. Then, the minimum torque to drive the soft arm for a given specification (W : 0.67 kg, μ : 0.15, P : 1.25 mm, de : 6.8 mm (M8)) is calculated as 0.35kg․mm. However, considering the dynamic inertial load of the soft arm, energy loss due to friction, and the motor efficiency, the actual actuator size should be decided greater than this result. Another important factor in the decision of actuator is the speed. For the given maximum operational speed of the soft arm, the maximum rpm of the motor is decided. Then, the RPM (Revolutions per Minute) of the DC motor is converted as 1,680 RPM. Same as the motor torque, the RPM should be decided with consideration of the safety factor. A large safety factor is given to the torque size since the system should compensate for the dynamic inertial load due to the motion of the soft arm. Figure 13 shows the results of simulation and experiment when the soft arm is bent to 45°and 90° on the X‐Z and the Y‐Z plane, respectively. 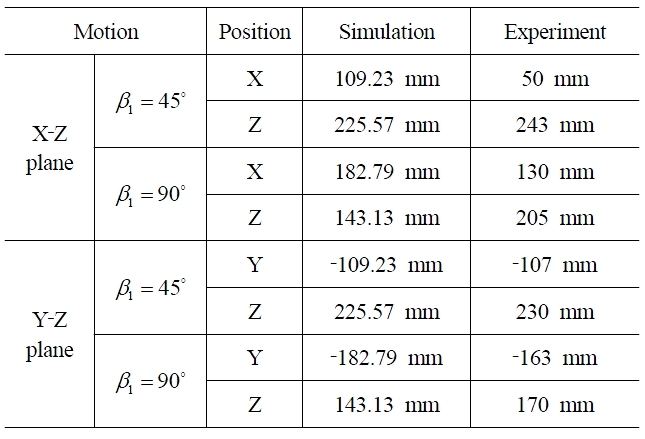 Table 4 shows the comparison of the simulation result and the experimental result. The error is caused by non‐uniformly deflection of each module and deflection due to gravity. The error can be minimized by kinematic calibration of the mechanism. However, the purpose of the proposed mechanism is an emulating of human gestures, not a precise positioning. Thus, using the control algorithm of the soft arm, we perform experiments in which the soft arm emulates several human gestures expressing human emotion and some service contents. Figure 14 shows the picture of a dual soft arm. Using this device, we would like to emulate several human gestures expressing human emotion and some service contents. The driving unit and the mechanism are separated. Thus, a wide range of workspace can be ensured and a very fast motion can be obtained because of the small inertia of the arm. Figure 15, 16, 17, 18 denote the gesture of the dual soft arm expressing “angry, “delight”, “sorrow”, and “surprise” emotion, respectively. Figure 19 and Fig. 20 show the gesture of the dual soft arm denoting “shaking hands” and “direction guide service”, respectively. The special feature of this soft arm is the spring‐backboned structure, which allows structurally flexible characteristic. Even in the case of collision with human, this device is able to absorb the impact. Fig. 21 shows that the soft arm deflects without giving damage to the human when it collides with the human body. The developed soft arm is implemented as the arm structure of a character service robot. The soft arm is used as the wing of the penguin service robot. This robot will be employed for the purpose of story‐telling to young children. Fig. 22 shows gestures expressing the four kinds of emotion and several service actions of the penguin service robot. The contribution of this study is the suggestion of a new soft arm with a spring backbone. The driving unit and the mechanism are separated. Thus, a wide range of workspace can be ensured and a fast motion can be created because of the small inertia of the arm. Even in the case of collision with human, this device is able to absorb the impact due to the spring backboned structure. This soft arm can be employed as a means of HRI by emulating gestures expressing several kinds of emotion. This soft arm mechanism was successfully implemented as the wing structure of a penguin service robot. 1.J.L. Burke, R.R. Murphy, and E. Rogers, V.J. Lumelsky, and J. Scholtz, "Final Report for the DARPA/NSF Interdisciplinary Study on Human–Robot Interaction," IEEE Transactions on Systems, vol.34, no.2, pp.103–112, May, 2004. 2.M. Blow, K. Dautenhahn, A. Appleby, C.L. Nehaniv, and D.C. Lee, "Perception of Robot Smiles and Dimensions for Human‐Robot Interaction Design," in Proc. 15th IEEE International Symposium on Robot and Human Interactive Communication, pp. 469–474, Sept., 2006. 3.M. Hackel, S. Schwope, J. Fritsch, B. Wrede, and G. Sagerer, "A Humanoid Robot Platform Suitable for Studying Embodied Interaction," in Proc. IEEE/RSJ Intelligent Robots and Systems, pp. 2443–2448, Aug., 2005. 4.H.‐D. Yang, A.‐Y. Park, and S.‐W. Lee, "Gesture Spotting and Recognition for Human–Robot Interaction," IEEE Transactions on Robotics, vol. 23, no. 2, pp. 256–270, April, 2007. 5.T.P. Spexard, M. Hanheide, and G. Sagerer, "Human‐Oriented Interaction with an Anthropomorphic Robot," IEEE Transactions on Robotics, vol. 23, no. 5, pp. 852–862, Oct., 2007. 6.S. Kawamura, Y. Hayakawa, M. Tamai, and T. Shimizu, "A design of motion‐support robots for human arms using hexahedron rubber actuators," in Proc. IEEE/RSJ Int. Conf. on Intelligent Robots and Systems, pp. 1520‐1526, 1997. 7.D.‐G. Choi, B.‐J. Yi, and W.K. Kim, "Design of a Spring Backbone Micro Endoscope," in Proc. IEEE/RSJ Int. Conf. on Intelligent Robots and Systems, pp.1815‐1821, 2007. 8.A. Bicchi, G. Tonietti, "Fast and "soft‐arm" tactics [robot arm design]," IEEE Robotics & Automation Magazine, vol. 11, pp. 22‐33, June, 2004. 9.J.‐J. Park, B.‐S. Kim, J.‐B. Song, and H.‐S. Kim, "Safe Link Mechanism based on Passive Compliance for Safe Human‐Robot Collision," in Proc. IEEE Int. Conf. on Robotics and Automation, pp. 1152‐1157, 2007. 11.M. Zinn, O. Khatib, B. Roth, and J.K. Salisbury, "Playing it safe [human‐friendly robots]," IEEE Robotics & Automation Magazine, vol. 11, pp. 12‐21, June 2004. 12.Y. Akamatsu, T. Nakamura, and Y. Kusaka, "Development of a soft manipulator with flexible joints using smart fluid and Pneumatics cushion for collision with human," in Proc. IEEE/ASME Int. Conf. on Advanced Intelligent Mechatronics, pp. 1‐6, 2007. 13.S.‐S. Yoon, S. Kang, S.‐J. Kim, Y.‐H. Kim, M. Kim, and C.‐W. Lee, "Safe arm with MR‐based passive compliant joints and viscous‐elastic covering for service robot applications," in Proc. IEEE/RSJ Int. Conf. on Intelligent Robots and Systems, pp. 2191‐2196, 2003.